Melodic metallers MASTERPLAN will unleash their first-ever concert release on October 9. "Keep Your Dream aLive" will be available as DVD/CD and Blu-ray/CD sets, both including the entire show from Masters Of Rock festival, recordings from Wacken Open Air, footage from the band's latest Asian tour and ProgPower USA, as well as all five official MASTERPLAN video clips. The Masters Of Rock show is featured on the CD. A performance clip of the song "Spirit Never Die" from "Keep Your Dream aLive" can be seen below. 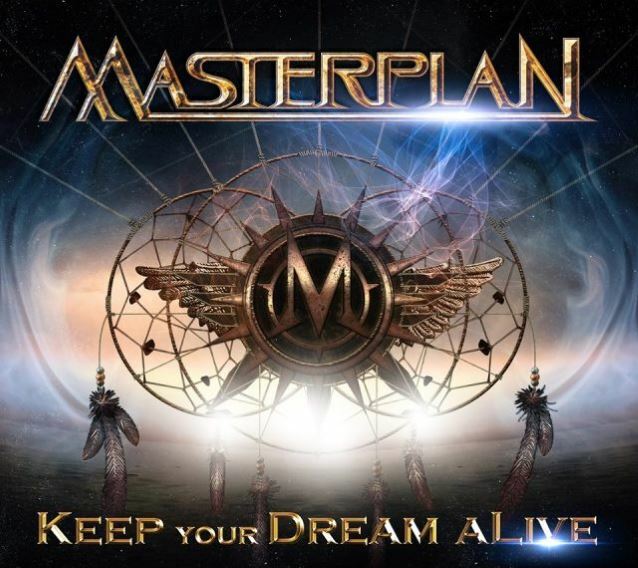 MASTERPLAN's new album, "Novum Initium", was released in June 2013 via AFM Records. Joining guitarist Roland Grapow (ex-HELLOWEEN) in MASTERPLAN's current lineup are drummer Martin "Marthus" Skaroupka (CRADLE OF FILTH), vocalist Rick Altzi (AT VANCE, SANDALINAS, THUNDERSTONE), who replaces Jorn Lande, and bassist Jari Kainulainen (STRATOVARIUS, SYMFONIA, DEVIL'S TRAIN). In an interview with Uber Rock, Altzi stated about the band's latest CD: "We decided to start afresh, not changing the whole MASTERPLAN trademark too much, but also not trying to think so much about the past. It was really more looking forward into the future. I think it was a very important decision not trying to copy the old style, but look forward and make something really good." Speaking to Myglobalmind, Grapow said about MASTERPLAN's numerous personnel shuffles: "I think that it's basically hard to explain why we always had singer changes. When we started MASTERPLAN with Jorn [Lande], a lot of people had warned me to be careful saying that he was very difficult. That he was never happy or satisfied with things. I think that the only thing that he really was concentrated on was trading on a solo career called JORN. Everything else for him was just a side project; he never saw MASTERPLAN as his main band. It was especially bad for me as I had put so much love, work and so much feeling for this band. I had given everything to make the band big. Jorn never did anything for us for this band. He never even said anything great about MASTERPLAN. That is not nice; you need a really good team behind you which loves this work. It's the same as a company — if someone is not dedicated totally 100%, it doesn't matter what a great voice he has. You stay on the same level, but now with a totally different lineup, we have a really big chance of getting further now. We can play live again. That just wasn't happening for about six years, which was quite terrible, to be honest."